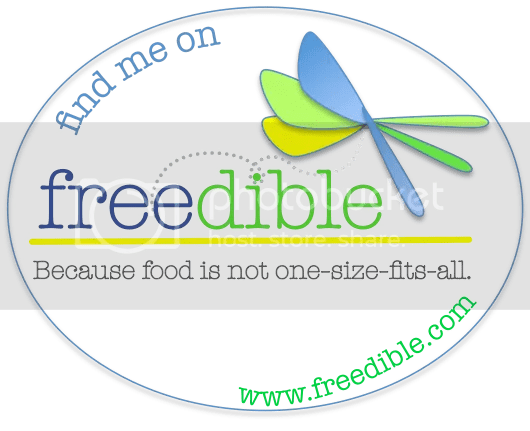 The Case of the Gluten Free Corn Dogs–and a Giveaway! I nervously answered my cell phone. The call was from our local neighborhood security company, and my husband and I were away on vacation. I let out a sigh. I’d forgotten Foster Farms had offered to send me their new gluten free corn dogs to review. I explained to the baffled officer that I was a food blogger and I’d have my neighbor put them in our freezer. That was last October. Those corn dogs sat in my basement freezer until the College Celiac came home for his winter break a few weeks ago. Because they contain soy, corn and egg which I’m allergic to, I couldn’t taste them myself. 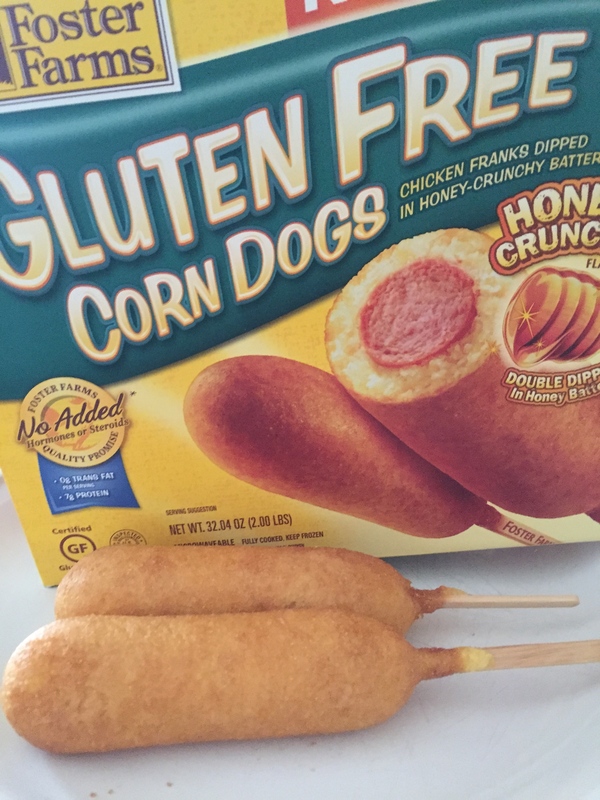 Which was really frustrating because I once liked corn dogs–before allergies and celiac disease–and the photo on the box taunted me every time I opened the freezer door. As soon as College Celiac dropped his backpack on the kitchen floor, I said, “Wanna corn dog?” I really needed that freezer space for the Christmas ham. College Celiac was more than willing to oblige. Corn dogs were always one of his childhood favs. He quickly microwaved two. After I took the obligatory blog photos, he microwaved the corn dogs again because they got cold. 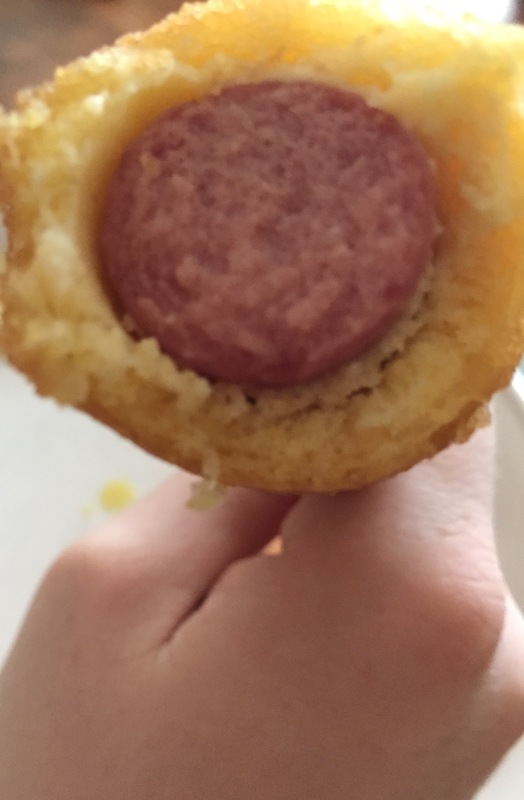 College Celiac’s review of Foster Farms Gluten Free Corn Dogs: Two Thumbs Up! My college boy was happy the breading didn’t crumble like a lot of gluten-free breading–even after microwaving two times–and he said they were tasty. Well, what he said was: “They taste like the corn dogs I used to eat.” This is high praise coming from a guy who hasn’t eaten gluten in three years. Of course, he added a little Cholula sauce–he and his brother eat everything with Cholula sauce! Kudos to Foster Farms for their gluten-free practices and their transparency. Wish more companies would publish statements about what they do to keep those of us with celiac disease and food allergies safe. You should be able to find Foster Farm Gluten Free Corn Dogs, as well as gluten free breast strips and nuggets, at your local grocery store. If not, call Foster Farms at 800-255-7227 for help finding a retailer. Even better, tweet this post with #FFGlutenFree, like this post and/or write a comment below, or like my Facebook page and you can win a voucher for a free box of Foster Farms Gluten Free Corn Dogs.